Class of 2008: Welcome to the City! Reshma Pattni ’06 and Win Chia ’06, New York Connection co-chairs, welcomed almost 100 Swarthmore alumni who gathered despite Tropical Storm Hanna’s wind-swept torrential rain. On June 1, the 364 members of Swarthmore’s senior class officially became alumni. On Sept. 6, the second annual worldwide Welcome to the City! 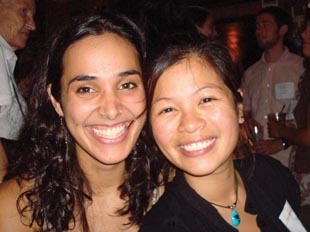 event was held to help these graduates acclimate to their post-Swarthmore homes. Alumni and friends in 18 different cities across the United States and around the globe gathered at locations including local bars, restaurants, an art gallery, and an alumna’s home to host the new graduates, pass on information about their new locales, and assist them in socializing and networking with other members of the Swarthmore community. The successful event would not have been possible without many alumni volunteers who coordinated in each city. Thanks to organizers and to everyone who participated. 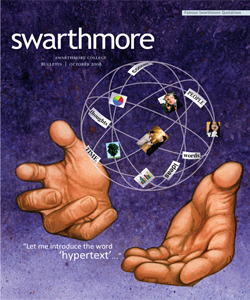 To sign up for next year, contact Geoff Semenuk at (610) 328-8453 or gsemenu1@swarthmore.edu. 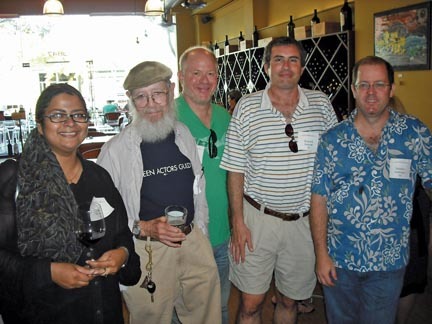 In Los Angeles, alumni met at Bottle Rock in Culver City. From left: Sainam Khan ‘93, David Shearer ’51, Barry Schkolnick ’80, Kenneth Schwab ’81, and Matthew Seeberger ’81. Did you just move to a new city? Are you interested in meeting fellow alumni who live near you or work in the same field? Do you feel like contacting a long lost classmate? You can update your contact information and search for alumni and classmates via the On-line Community at olc.swarthmore.edu. Where Have You Been in Your Swarthmore Gear? Class of 2012: Welcome to the College!